With the emphasis on new parents to create a space for their newborn that is bright and inviting as well as safe, an additional concern today is also the eco-friendliness of the environment for the baby. Because there are so many aspects of creating the optimal eco-friendly environment, parents can benefit from a checklist to create the perfect eco-friendly nursery. According to Parenting magazine, there is no greater benefit to a newborn than a room that takes in mostly natural sunlight. Natural light will reduce the consumption of energy in the nursery with less use of artificial lights throughout the day. Any artificial light should be an LED alternative that can last up to 50,000 hours. Once you have addressed any lead-paint issues, consider the kind of new paint you will use and make sure it is free of what are known as volatile organic compounds (VOC). According to the Children’s Environmental Center at Mt. Sinai, these carbon-based chemicals quickly evaporate into the air in any environment and release over time. They can cause nausea, dizziness, eye irritation and even respiratory issues. There are a wide range of paint products on the market that are free of VOCs and identify this on their label. Most lighter colors also carry far less VOCs than brighter and bolder tints. Even though natural wood is a more “green” option, you have to be careful to choose wood that has not been treated with a stain or clear glossy finish that will more than likely give off toxic fumes. Look for furniture that has been tagged by the Forest Stewardship Counsel (FSO) as safe for a baby’s environment. Most stores that specialize in nursery furniture will only carry this type of furniture ensemble or individual furniture items such as rockers, changing tables, drawers as well as cribs. Also, the more “green” it is for your baby, the better it is for the environment in general. When choosing window fabric, begin with natural materials like a bamboo or a woven fabric of cotton blend. They are a breathable fabric that circulates air much more efficiently, and when they wear out, they can easily be tossed into your recycle bin without worrying about adding to any landfill. Linen, silk and wool are less breathable materials but still eco-friendly alternatives. Solar shades are also an option that contributes to using natural light as your main source of illuminating your baby’s room for conservation of energy. Start by looking for a natural material that will not contain petrochemicals. You can opt for a natural latex mattress that does not emit harmful gasses. Other alternatives are organic wool and cotton. Once you choose verified organic bedding, don’t be put off by the dye used to color it, it is always done with natural dye products. Most eco-friendly bedding comes with choices in natural fabric décor as well. It is beneficial to know what to avoid first before you start your search for eco-friendly flooring for your baby’s room. Carpet that is wall-to-wall is probably something that should be avoided. It not only emits fumes over a period of time, but it also holds in dust that contains allergens that could be detrimental to the baby’s respiratory development. If you are in a home that already has installed new carpet and don’t want to go through the expense of removing it, then invest in a HEPA filter for your vacuum, which should eliminate most bacteria, dust and other pollutants circulating in the air. Rugs are the best choice and can be found in abundance in organic form, including natural dyes in a variety of colors and designs. They are also mostly hypo-allergenic and 100% non-toxic. It also gives you the opportunity to install a natural hardwood floor that alleviates most pollutants and dust, because it can be swept daily and rugs can be washed weekly. 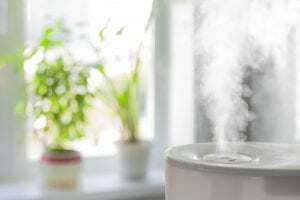 According to the Environmental Protection Agency, multiple studies have shown that the air purity in any home can be up to five times less pure than outside of the home. This is something to take extra consideration of when you are bringing home a newborn. You can consider using natural purifiers such as lavender or jasmine plants strategically placed around the room. They will not only act as a purifier, but they will leave a sweet-smelling aroma in the room throughout the day. If you want to tackle airborne allergens and bacteria that may be present, consider investing in an air purifier that can be set up in the room and used at your discretion. It not only helps a baby’s lungs to expand, but it limits the amount of toxins that are going into the air.